Triple H and Brock Lesnar will have a third shot at impressing Bret Hart. 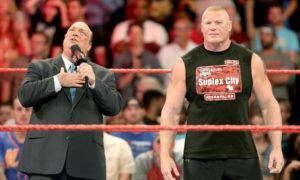 Paul Heyman and Lesnar shot an angle on Monday Night RAW to set up the trilogy which will end with a steel cage match at the 2013 Extreme Rules pay per view event. I have to admit that I groaned when word leaked yesterday that the angle was coming. After seeing Brock and Hunter a second time at WrestleMania, I felt that I had seen enough. Was there even interest in a trilogy here? I didn’t think so but I completely counted out the x-factor and shame on me for doing so. That x-factor of course is Paul Heyman. Heyman’s promo to set up the angle on Monday night was downright brilliant. I completely forgot about the disappointing match and finish at WrestleMania 29. Heyman put over the steel cage match better than anyone has in about five years. It reminded me of the localized promos I’d watch as a kid whenever the WWF would bring a cage match to the Spectrum or Madison Square Garden. Heyman may have pulled out a miracle here. The third match doesn’t make sense for one reason. How do you top a match with the stipulation that one of the loser’s must retire? Pride and bragging rights are nice, but nothing other than repeating the stipulation can top that in my opinion. If the idea all along was to do a trilogy I have no idea other than panic why they would shoot the retirement stipulation early in match two as opposed to three. Another takeaway here is that everyone was so concerned that the second match was too predictable. Does anyone for a second expect Lesnar to drop two in a row to Hunter? I can’t imagine any logic whatsoever in doing so. I would honestly be shocked to see it. How do you sell suspense when everyone has a pretty good idea what the finish is going to be? All of that said, the buyrate for this show is going to be incredibly interesting. Did Lesnar lose any juice (no pun intended) as a draw after losing at Mania? I think he has but the proof will be here in the final number. Brock doesn’t come cheap and even a win over Triple H doesn’t mean a whole lot in the big picture. Whether this is a complete waste of the limited dates the WWE has on Brock or not will be answered with the buyrate. Last year coming in fresh from his UFC run and headlining with John Cena, Brock pulled in an extra 54,000 buys, increasing the buyrate from 25% the previous year. So there is a benchmark here. The company was also coming off of its biggest WrestleMania ever. Whether 29 is that big or not has yet to be determined. Even with the increase, the company reportedly expected more and were disappointed initially with Lesnar’s impact (remember Lesnar teasing a return to the UFC after those rumors came out?). What are the expectations for Lesnar, along with a stronger supporting match in John Cena vs. Ryback? The numbers will certainly tell a story here and will prove bloggers like me right about the WrestleMania finish or make us look foolish.